I'm not sure I should call this post a "history lesson" because not much is known about this postcard or the image on it. I got this in an on-line auction about ten years ago. I was pretty sure it was old based on the printing style and layout which was typical a hundred years ago or thereabouts. The image appears to be a colorized monochrome photo. 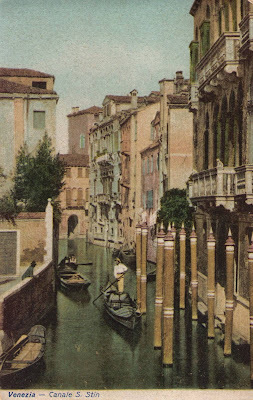 The postcard indicates that the setting was on the "Canale S. Stin". which is in the San Polo distirict close to the famous Frari church. Most of the current-day references call it "Rio di S. Stin". There is also a Campo San Stin in the same area. Now let's take a closer look at the gondola and her gondolier. 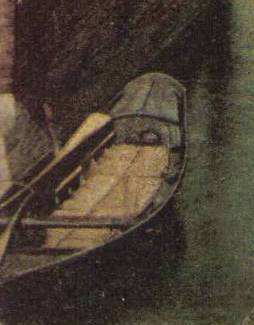 The diagonal trim pieces on the bow and stern decks are characteristic of gondolas from long ago. The stern deck on the port side doesn't appear to have a pontapie or pedana - the wedge used by the gondolier to push from sometimes. The angle of the gondola doesn't give us much certainty about whether she's asymmetric. If she was built in perfect symmetry, she may have been built earlier than 1850. One very interesting feature of this gondola is how much of her hull is in the water. 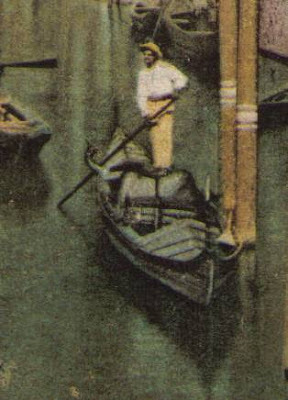 It is said that the older the gondola, the more of her length is in the water. Based on that, this looks like a very old boat. Postcards didn't really arrive in Europe until 1870. My theory: This postcard may be as much as 130 years old, but I would guess it was produced in the 1920's, and the photograph was either taken much earlier, or it was a photo of a much older gondola. Anything earlier than the 20's and Europe was in WWI, anything later and the Second World War would have been happening. Now, just for kicks, take a close look at the sandolo which was moored along the side of the canal. You don't often see sandoli in postcards. The little boat looks like she's just waiting for someone to jump in and row her away.